This Pumpkin Roll creates a lovely pinwheel design by wrapping a honey colored sponge cake around a cream cheese filling that is full of toasted pecans. Besides looking pretty this pumpkin spice cake is deliciously light and moist with so much flavor. It is so good that you may want to add it your Thanksgiving menu. You can make this dessert a day or two in advance of serving, just be sure to store it in the refrigerator. If you want to dress it up, cut the sponge roll into slices and then top each slice with a rosette of whipped cream and a sprinkling of chopped nuts. 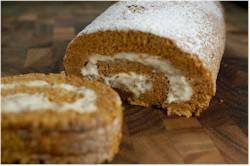 To make this Pumpkin Roll you follow the basic rules for all sponge cakes; that is, eggs and sugar are beaten until thick and fluffy, and then the rest of the ingredients are added. Now, the biggest problem people seem to have with a sponge roll is cracking. While this particular sponge roll does crack a little, one way to minimize this is to roll the cake in a clean towel immediately after removing it from the oven. Doing this step helps to set the roll's structure so that once it cools it can be easily unrolled, filled, and rolled up again with little cracking. To make our lives easier instead of making our own pumpkin puree we can buy canned pure pumpkin which I think is every bit as good as homemade. Just make sure you do not buy the pumpkin which already has the spices added to it. However, if you want to make your own puree start by using the smaller pumpkin varieties like Sugar Pie, Baby Bear or Cheese Pumpkin (approximately 5-7 lbs., 2 1/2 - 3 1/2 kg.). Then first cut the pumpkin in half lengthwise, remove all the seeds and stringy fibers, and then place cut-side down on a greased baking sheet. Bake at 350 degrees F (180 degrees C) for approximately 45 - 90 minutes (depending on size) or until easily pierced with a knife. Scoop out the pulp and puree in a food processor until smooth. You do need to extract all the liquid, so strain the pumpkin through a cheesecloth lined strainer and then cool the puree before using. Pumpkin Roll: Preheat your oven to 375 degrees F (190 degrees C). Butter, or spray with a non-stick vegetable spray, a 15 x 10 inch (38 x 25 cm) baking pan. Line the pan with parchment paper, and then butter and flour the parchment paper (or spray with non stick spray that also contains flour). In a bowl sift or whisk the flour with the baking powder, baking soda, ground spices, and salt. Place the eggs, sugar, and vanilla extract in the bowl of your electric mixer, fitted with the paddle attachment (can also use a hand mixer). Beat on high speed until thick, pale yellow, and fluffy. (This will take between 5-10 minutes.) (When you slowly raise the beaters the batter will fall back into the bowl in slow ribbons.) Beat in the pumpkin puree. Gently fold in the flour mixture. Pour the batter into the prepared pan, evenly spreading the cake batter with an offset spatula or the back of a spoon. Bake for about 13 - 15 minutes or until a toothpick inserted in the center comes out clean and the cake, when lightly pressed, springs back. Immediately upon removing the cake from the oven invert the pumpkin roll onto a clean dish towel that has been dusted with powdered sugar. Carefully peel off the parchment paper, sprinkle the cake with powdered sugar, and roll up the pumpkin roll, with the towel, while it is still hot and pliable. Place on a wire rack to cool. Filling: Beat the cream cheese, butter, and vanilla extract until light and fluffy. Add the sugar and beat until smooth. Then fold in the chopped nuts. To Assemble: Unroll the pumpkin roll, spread with the filling, and reroll. Transfer to your serving platter. Cover, and chill in the refrigerator for a few hours or overnight. (You can serve this cake immediately but chilling it for a few hours, or even overnight, sets the filling and makes it easier to slice.) Just before serving, dust with confectioners (powdered or icing) sugar. Note: To toast the pecans or walnuts. Place the nuts on a baking sheet and bake in a 350 degree F (180 degree C) oven for about 8 minutes or until lightly brown. Remove from oven, let cool, and then coarsely chop.